Happy Tuesday my pretties! Alison McQuain is going to be a new feature here at Fanciful Ink...we have plans of a collaboration down the road that I hope you will be thrilled about. In the meantime, she's going to be our guest for a bit. Today she comes bringing banana bread! Well, sort of, you have to make it yourself though. 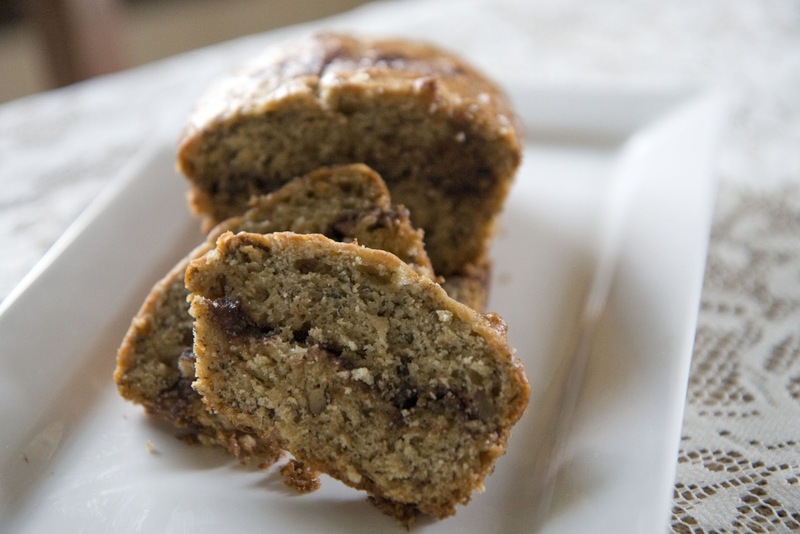 She has included healthier options for the banana bread so you can feel better about eating it! So without further ado, here she is-my awesome friend, former coworker, Italy traveler, bridesmaid, photographer of AMP....(drumroll please)...ALISON McQUAIN! Hello again my fanciful people! I am coming to you today with a recent breakthrough in the kitchen! It was a big big day in the McQuain household. Either I am dense and have failed to know that other geniuses across this fine globe of ours partake in such goodness or I am the FIRST genius to think of this. Ok. Here it goes. Banana Nut Bread with a peanut butter and nutella center!!! Keep breathing. I know you are excited. Yes, I too had such excitement on Sunday when I created this masterpiece of flavors. So excited, Laurie and I knew this knowledge had to be shared. It is so easy and more than worth the 30 minutes of mixing and 25-30 minutes of baking. My bread starts off with a recipe from a church cookbook. The church I grew up in produced a cookbook of many wonderful southern showstoppers. This banana bread is one of them. Therefore, you can imagine what the nutella does! In thinking of the New Year we find ourselves in, one might be wondering what some “better for you” substitutions are to the standard calorie-laden ingredients. You will find the recipe below along with some “smarter” substitutions. In a medium bowl, measure and sift together flour, soda and salt. (If using nuts, stir them into the flour mixture so they incorporate into the wet ingredients well) Set this aside. In a large bowl, cream butter and sugar, add eggs and vanilla. Stir in the mashed bananas. Fold in the dry ingredients in quarters to mix well without over mixing. This will make enough for 5 small loaves, two regular-size loaves or over a dozen muffins. 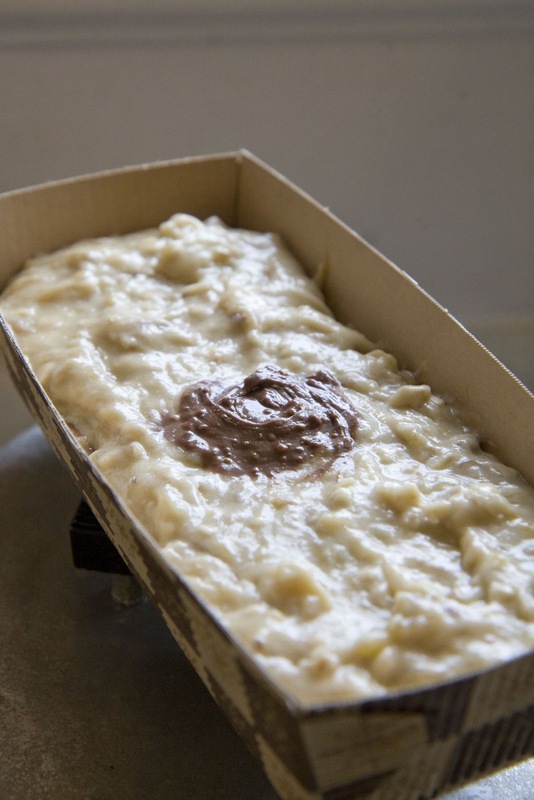 Use well-greased loaf pans and muffin papers. 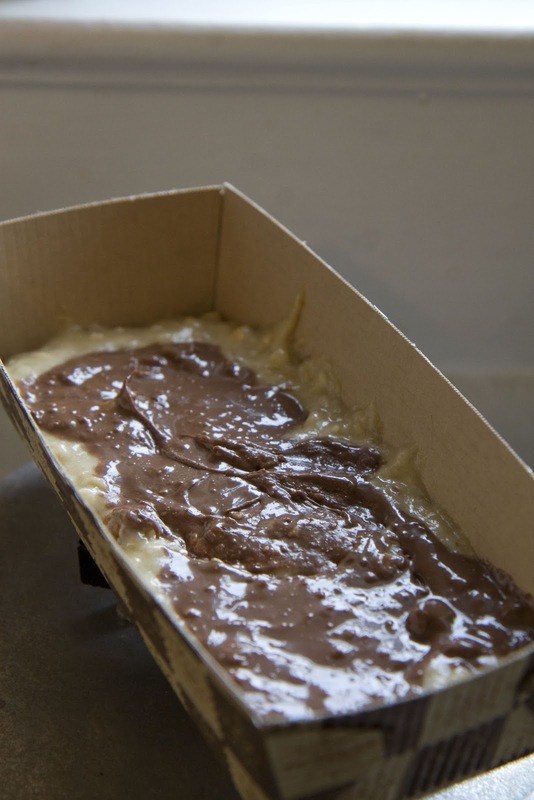 When pouring into the desired baking dish fill halfway then spread your desired amount of the nutella mixture on top of the first half of batter then add remaining batter. Fill pans ½ - ¾ of the way full. Bake at 325-325 degrees for 50-55 minutes (regular-sized loaves). I added some Nutella on the top of the loaf to remember which one was the prized loaf!